Education is being juggled more than ever between pedagogy and corporate control AND it is personal — for you — for me — for our children. The marketing strategy of adaptive learning systems is that of 24/7 services that you can access at any time, in any place and at any pace. Education has adopted this language to reduce costs with business-like customization and streamlined productivity. The expectation is for a flexible education system that will also be more efficient and cost effective. “The adaptive learning system crusade in schools is organized, growing in power and well-funded by venture capitalists and corporations. Many companies are looking to profit from student and teacher data that can be easily collected, stored, processed, customized, analyzed, and then ultimately resold”. There’s money in it, but not for the right reasons nor for the right people: our children. I read this research by Phil McRae and it all made sense. This time it is personal. Corporations are taking our educational system, shaking it up and spitting out children who cannot think for themselves. They are calling it cost-effective but actually, adaptive learning systems are more costly than we know. It is all about the data this time. This is so dangerous for our society that I have to speak up and hope you speak up about this also. We need to fight for our children and their future and their data. Framing adaptive learning systems as “personalized learning” has to stop. 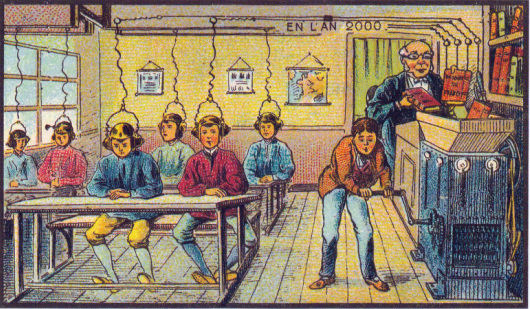 This image “At School in the Year 2000” – a futuristic image of learning as depicted on a postcard from the World’s Fair in Paris, Circa 1899 predicting what learning will be like in France in the year 2000. It is scary that this depiction is becoming true in the US and other parts of the world because we are being sold a bill of goods. Corporations and politicians are really good at framing what they believe we want to hear around a philosophy or concept that markets something they want to sell or use. The idea of children having their own personal choice how they will learn is being redesigned as increasingly data driven, standardized, and mechanized learning systems. Children should not be treated like automated teller machines or credit reward cards where companies can take their valuable data. It is all about control and saving money. But who’s money? Yes, technology can help personalize learning, but what technology and how? And who’s data? Let’s be real: adaptive learning systems are for those things that can be easily digitized and tested like math problems and reading passages. They do not recognize or encourage high quality learning environments that are creative, inquiry-based, active, relevant, collaborative, and what our children need to be global citizens who are critical thinkers and problem-solvers. We did this before. McRae reviews the history of using technology to control learning. It was all about feeding information to kids and controlling what they learned. B.F. Skinner did this in the 1950s where learning was about measurability, uniformity, and control of the student. I grew up then and remember having problems understanding some concepts. That was mainly because everyone in the class was supposed to learn the same content at the same pace — too much content — too fast for most of us. I was provided an “intelligent tutor” outside of the classroom and sat in front of a screen answering multiple choice questions about what I read. I felt stupid and ashamed. It still didn’t make sense, but the teacher didn’t have extra time to spend with students falling behind. I know I’m smart, but I felt stupid in many of my classes. If I went through that then, how many others felt like me? I wanted to give up, but one teacher and my parents believed in me. They spent time with me figuring out why I didn’t get it. That’s all I wanted — time with a real person who cared. We didn’t have all the technology then that we have now or I would have googled it and figured it out by myself. The problem with the technology then was that it wasn’t personal for me. It was the same worksheet I didn’t understand in the first place now on a screen. In the 1970s and 1980s, Computer-Assisted Instruction (CAI) became the next big thing. Programs like PLATO (Programmed Logic for Automated Teaching Operations)and Computer Curriculum Corporation (CCC) were building labs for schools for large numbers of at-risk children paid with Title I money and categorical funds. I remember these because I was asked as technology coordinator and professional developer to help set them up. Schools put these labs in any area that would fit. Some high poverty schools had them set up next to heaters and most were managed by a parent or para-professional. Teachers would rotate their classes in and out every week. Kids were so excited at first to play the games that supposedly taught concepts they needed to learn. After about six months, kids got bored with the games and clicked on any keys just to get through the games. There was nothing relevant or made sense for them to be there. Kids are so much smarter than we give them credit. When they were in their classes, they felt like they could maybe ask questions about their learning. But, in the lab, there was no one or no way to question what or if that was the one right answer. After a few years, the labs were dismantled or used for other purposes. But all the money was gone so there was no one left to run the labs or train the teachers. Dreambox is now framing their system as “Intelligent Adaptive Learning” and others are starting to use the term “Intelligent Tutors.” Companies are creating hundreds of white papers and studies to prove that adaptive learning systems benefit our children. Be careful! Read them closely for the messages being delivered. We need to be critical consumers for our children’s sake. As I said in my own situation, all I needed was time and someone who cared and listened to me. Today the technology is at our fingertips and children are using technology at younger and younger ages. We don’t need to spend millions on these systems. Information is available when we need it now. We just need to teach our children how to acquire the skills that help them access, evaluate, and use the information they find. We cannot feed information to children from “Teaching Machines” like what was in the 1899 postcard and what Skinner projected. It didn’t work in the 50s or the 90s. It won’t work now. This is dangerous for our children and our society. Our children need caring and compassionate classrooms that encourage independent, creative and collaborative work. Technology is changing rapidly. We don’t need to go backwards and plug our children into machines. They will do that on their own but they need guidance in a different way. They need to know what is happening with their data. Schools protect student data, but adaptive learning systems sell the data to third party companies. Consider all the free social media and other programs available that collect data from you. You probably are aware when you sign in to certain programs, they know you and your data. But you might not have known that your child’s data including social security numbers and health concerns are being sold to third parties. This is dangerous! It will get even more dangerous if the government funds it and encourages the use of adaptive learning systems without some oversight. Teachers need to know how to facilitate a different kind of learning environment that is flexible, personal, and creative. Personalized learning means that learners own and drive their learning not the technology using algorithms based on performance that controls learning. Learners need to learn how to think on their own. This will not happen if adaptive learning systems control how and what they learn. It is personal now! Let’s all work together and do the right thing for our children. Teach them to learn, unlearn, and relearn. Show them that they can drive their learning so they can reach their fullest potential.